Helicopters from a European rapid reaction force whiz overhead in the tense capital. Underneath, activists gather around one of the residences of second-round candidate and former rebel leader Jean-Pierre Bemba. One of them says the debate must take place. He says Congolese must see who is capable and who is not capable. He also says they must realize president and candidate Joseph Kabila speaks French with an accent and would be very limited in his answers. But the media authority canceled the planned debate after the two candidates disagreed on its format. Mr. Kabila's camp said it wanted a pre-recorded debate, with the two candidates answering the same questions but from different locations, citing security reasons. Mr. Bemba said he wanted a live, face-to-face debate to gauge "intellectual capacity." A resident in Kinshasa shared his opinion with VOA about why the debate would have been helpful. "People want to know what is the program of the men who want to lead our country," he said. "We had a lot of problems during the war. The country collapsed. We have lots of problems in the economy, social [situation], environment, in politics and people want to know what and how the candidates will find good solutions to help Congo to go up, to go on." But an aide to Mr. Kabila says his camp was afraid a live debate would be "under the belt." He says Mr. Bemba would ask who Mr. Kabila's parents are and call him a foreigner. He says Mr. Bemba might well jump from his lectern and attack Mr. Kabila. Mr. Bemba's supporters say Mr. Kabila is not the son of former coup leader Laurent Desire Kabila, who was assassinated in 2001, but rather a handpicked successor who is not Congolese. 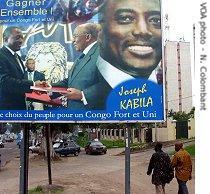 The young Kabila denies this. He has not campaigned during the second round, saying it is too dangerous - preferring to send his wife, instead. An organizer from a small political faction boycotting the election process, Mbwebwe Kabamba, says the debate was trivial, given the current context. Nothing in the campaign, he says, has been marked by principles of democracy, debate and tolerance. He says everywhere in the Congo campaigning degraded into clashes. Debate or no debate, he says, the most important thing is to have elections that lead to lasting and stable peace after years of bad governance and conflict.